Hidden Turkey info about the game-Games2Rule. Hidden Turkey is another point and click type hidden object game from Games2rule. In the time of thanksgiving festival Turkey are hidden all around the place!! 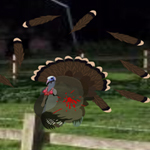 Shoot the Turkey with archers bow and arrows. Avoid clicking unnecessarily as otherwise your time will get reduced. Good luck and have fun!